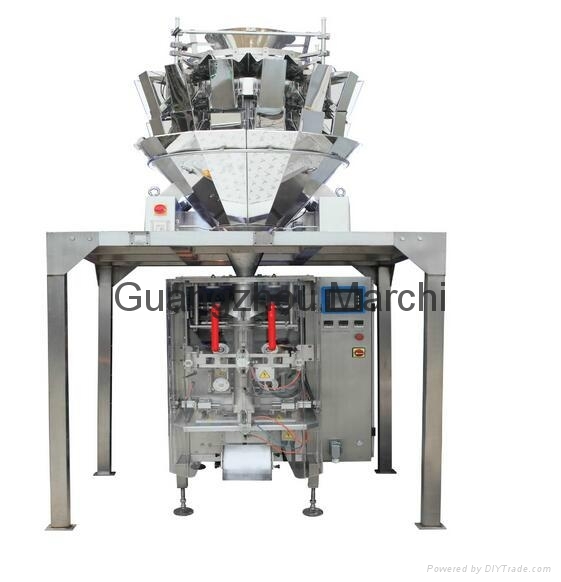 The unit consists of a VFS7300 vertical filling packaging machine, a combination scale (or CJS2000-F weighing machine) and DT2 vertical bucket elevator, integrates the functions of weighing, bag-making, edge-folding, filling, sealing, printing, punching and counting, adopts servo motor driven timing belts for film pulling. All the control components adopt international famous brand products with reliable performance. Both transverse and longitudinal sealing mechanism adopt pneumatic system with stable and reliable action. Advanced design ensures that adjustment, operation and maintenance of this machine are very convenient.